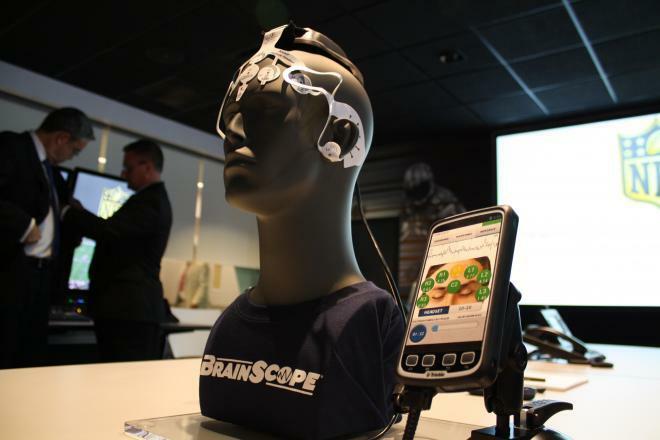 Can Technology Alone Solve the “Concussion Crisis”? Connor McDavid. Photo from Yahoo Sports. The media conversation surrounding sport’s ongoing “concussion crisis” took an interesting turn in early December 2016. In spite of the wide assortment of sophisticated technologies heralded as providing the next big breakthrough in protecting athletes from the effects of brain trauma, the debates around how to best diagnose a concussion revolved around a pair of human eyeballs. On December 4, Edmonton Oilers superstar Connor McDavid was controversially removed from a game against the Minnesota Wild to be assessed for concussion symptoms. McDavid’s absence was ordered by a league-appointed concussion spotter monitoring the game on television from NHL headquarters. Although he was later cleared to return, the Oilers failed to score on a 5-on-3 power play during McDavid’s absence and lost in overtime. A frustrated McDavid commented after the loss, “I was pretty shocked, to be honest. I hit my mouth on the ice. You reach up and grab your mouth when you get hit in the mouth, it’s a pretty normal thing. Obviously the spotter thought he knew how I was feeling. So he pulled me off.” The incident proved controversial as teammates and fans challenged the spotter’s judgement while journalists argued that McDavid’s frustration proved that the NHL’s concussion protocol was working. The fallout from the McDavid incident exemplifies a general distrust of subjective knowledge regarding how sport-related concussions are diagnosed and treated. The story goes something like this: athletes can’t be trusted because they are unfairly asked to make snap interpretations about what just happened to their brain in the heat of a game. And besides, as Deadspin’s Barry Petchesky writes, even if they feel like something’s not quite right, they’ll probably just lie about it anyway. Coaches want their best lineup available and may prioritize winning over the health of their players. Team doctors may make biased decisions about whether or not a player should remain in the game and need to be held in check by the presence of “independent” medical professionals. And, of course, the naked eye of a concussion spotter can’t possibly determine how an athlete is feeling through a television screen. These types of warnings and safeguards, of course, are absolutely necessary. Widespread underreporting of concussions by athletes is well-documented and cause for alarm, as are concerns about the reliability and interpretation of baseline neurocognitive data used to assess concussion symptoms. The decisions made by coaches and in-game medical professionals should certainly be kept under close scrutiny. The ongoing call from scientists for reliable quantitative or objective diagnostic techniques supports a broader media narrative that celebrates technology as inevitably providing a readymade solution to the concussion problem. With headlines like “Can technology save football?” and “New helmet technology could lead to fewer concussions” trumpeting the march of scientific progress, journalists gleefully report on how advancements in everything from protective equipment; medical devices; blood, hearing, and balance tests; neuroimaging techniques; accelerometers; and brain training software might offer the technological breakthrough that would literally change the game and make sports safe again. Preoccupations with scientific progress and technological innovation, however, shape the types of conversations we can (and can’t) have about protecting athletes’ brains. As Bachynski and Goldberg warn, suggesting that scientific interventions will offer the most effective solutions to the concussion problem constrains our ability to ask fundamentally moral and political questions about how we define acceptable levels of risk and violence in sports. I want to be clear: scientific research, clinical studies, and technological advancements will be absolutely vital in how we address the health of athletes going forward. We especially need to support these efforts in our current “post-truth” era of fake news, alternative facts, and outright censoring of scientific data. In fact, some researchers have already expressed fears that the Trump administration could make funding for concussion research much more difficult to obtain. Yet supporting the work of scientists and celebrating the merits of facts can’t come at the expense of the value we give to “subjective” knowledge and, its academic cousin, qualitative research. While almost exclusively defined in medical or scientific terms, sport-related brain trauma is a cultural phenomenon that influences interpersonal relationships and emotional wellbeing, shapes identities, and is connected to economic systems. In coming together to address sports-related concussion as a public health issue, we also need to understand the social, political, and historical contexts in which these injuries take place. Matters of culture and experience must be put in conversation with the world of scientific studies and technological innovation. An interdisciplinary conversation, one that values both “subjective” and “objective” knowledge, is paramount to grasping the implications and complexities of the concussion issue. That said, there does appear to be a growing comfort level with public discussions of toughness and manliness as they relate to brain injuries. Some high profile athletes have been outspoken on the matter while it is becoming more common for sports organizations to warn young competitors against “toughing it out” when the health of their brain is at stake. Harrowing tales of dementia and depression among retired pro athletes or the tragic death of Canadian rugby player Rowan Stringer serve as a powerful cautionary tales about the dangers of underestimating the consequences of brain trauma. Yet the strides made through these efforts should not trick us into believing that this message is no longer relevant. Oilers tough guy Patrick Maroon’s comments after the McDavid incident, punctuated by his reminder that hockey was a “man’s game,” demonstrates that the “concussion crisis” has not made traditional notions of masculinity and toughness in sport disappear. I’ve also written previously about how conceptions of toughness are multi-faceted and only one of the ways in which concussions are defined in cultural (rather than scientific) terms. Simply telling someone to be “man enough to admit when they’re hurt” overlooks how sports are complex social environments that evolve depending on who’s playing, where, and why. We can examine these important differences by asking athletes about experiences of brain injury and recovery, but we also need to analyze how their responses might influence (or prohibit) change both within and beyond the culture of sports. We also need research recognizing that the subjective aspects of the concussion issue don’t end with what happens on the playing field or in the locker room. The lab and the clinic are themselves cultural spaces. There already exists a lot of great writing about how neuroscience as an academic discipline has its own culture with a complicated history, intricate economies, and its fair share of contradictions. Yet too few social scientists are included on the “interdisciplinary” teams that drive concussion research and shape future approaches to brain health. A more holistic understanding of brain trauma in sport needs to include a critical examination of decisions made throughout the scientific process and how complex research findings get packaged for consumption through the media. There are indeed subjective aspects to the production of objective data. What we know about brain trauma in sport can only be enhanced by accounting for the messiness of cultural experience. This process should involve embracing subjective knowledge, not as something to be eliminated or circumvented, but as an important part of this complex and rapidly changing story.